CHESTNUT HILL, Mass. - Five different players scored and eight different players had at least one point on Saturday afternoon as the Boston College women's hockey team skated to a 5-1 win over Syracuse at Kelley Rink. Freshman Maddy McArthur made 22 saves for her first career win while Lindsay Agnew and Cayla Barnes tallied their first career points in the Maroon and Gold. Makenna Newkirk became the fifth player in program history to reach 150 career points. After a relatively quiet opening 10 minutes in terms of chances - but holding a 4-1 edge in shots on goal - BC finally broke open the scoring. Caitrin Lonergan's first of the year was followed up two minutes later by the junior Agnew's first as an Eagle. Megan Keller's power-play goal early in the second made it 3-0 in favor of BC and the team settled in. When tested in the second period, McArthur was up to the task. As the clock ticked towards three minutes to play, the freshman flashed the left pad on a hard shot from the slot to keep it 3-0. Daryl Watts' first of the year made it 4-0 with just over a minute to play in the frame. McArthur also had three timely saves in the first four minutes of the third frame to keep the momentum on BC's side. And while Syracuse finally broke through seven minutes into the final frame, McArthur's diving save at the right post kept the visitors at just one score. Newkirk pushed the lead back out to four goals with her third point of the day - and first goal of the season - to give the game its final 5-1 score. Maddi Welch finished with 27 saves for the Orange to McArthur's 22. BC held the final edge in shots at 32-23. Both BC (1-for-3) and Syracuse (1-for-2) tallied power-play goals. Saturday, Oct. 6, 2018 | 2 p.m.
1st, 14:21 | 1-0, BC GOAL: Grace Bizal picked the puck up behind the BC net and skated up the left boards. Her bounce pass into the neutral zone found Lonergan and she took it down the left wing and past a defender to the net. Lonergan and Brown - crashing the net up the middle - passed it back and forth, with Lonergan tapping it in at the left post. 1st, 16:03 | 2-0, BC GOAL: After Newkirk won the draw to the right of McArthur, Bizal sent it around the net to Watts at the hashmarks. Watts' centering pass hit a streaking Agnew and the junior split the defense before rifling a shot from the top of the left circle into the upper right corner of the net. 2nd, 3:18 | 3-0, BC GOAL: Agnew walked off the wall and hit Newkirk with a pass at the left point. Newkirk then threaded a pass to Keller at the right dot for a one-timer, power-play goal. 2nd, 18:54 | 4-0, BC GOAL: Serena Sommerfield stood the rush up on the boards, allowing Newkirk to pick up the puck and skate through the slot. Newkirk hit Agnew with a pass at the right post and Agnew went back across to Watts for a snapshot at the left post. 3rd, 7:04 | 4-1, SU GOAL: The puck popped down to Abby Moloughney at the right circle and she hit Brooke Avery at the left post for a tap-in to just beat McArthur. 3rd, 12:10 | 5-1, BC GOAL: Lonergan circled around the net and cycled back to Barnes behind the net, allowing Barnes to turn a fire a pass across the crease to Newkirk at the right post. - With her assist in the second period, Newkirk tallied her 150th career point, becoming the fifth player in program history to do so. 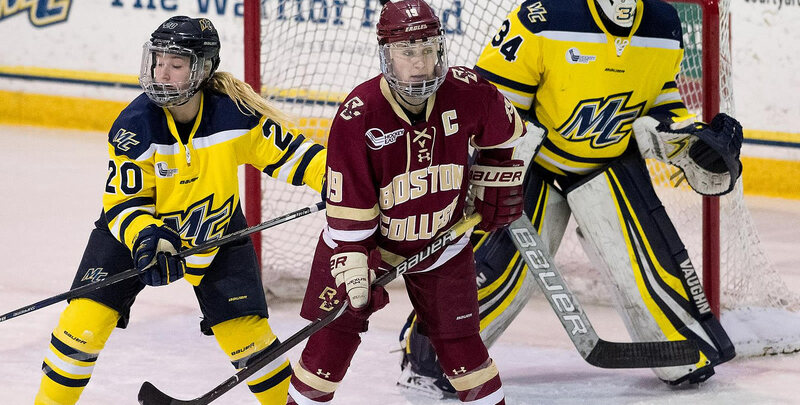 - Agnew's goal was her first at BC while Barnes' assist was her first career collegiate point. - With the win, BC takes an edge of 6-1-1 in the all-time series. - The Eagles are now 16-8-1 all-time in the home opener and 10-1-1 under head coach Katie Crowley. - This is BC's third-ever win over Syracuse in the Eagles' home opener. - Bizal finished with two assists to tie her career high. - Four players - Newkirk, Lonergan, Agnew and Barnes - earned their first points of the season. The Eagles will remain home next week for a two-game series with St. Lawrence on Thursday, Oct. 11 and Friday, Oct. 12.